User behaviour is a statistical indicator in a cellular network, directly affecting network performance and providing critical insight for the network service provider. Knowing the statistical properties of users provides useful insights for optimization operations of both circuit and packet switched architectures. Furthermore, characterization of user behaviours will help us to understand the traffic demands and to determine the traffic/usage anomalies. In our project, analysis and modelling of arrival and service processes are presented in a comprehensive fashion in order to determine statistical properties of voice traffic from end-user perspective in accordance with the queueing theory. According to this theory, user behaviours of a system can be characterized by using arrival process and service process. The aim of our project is to characterize user behaviours in voice transmission from the end-user perspective. In line with this aim, the system model designed to obtain an end-user based dataset used within our project is shown in Figure 2. In this system, which was designed to collect data from cellular networks, data are achieved from both 2G and 3G networks. The mobile applications was developed based on the Gingerbread and Ice Cream Sandwich versions, which are the using rate of 33.1% and 22.5%, respectively, as of August 1, 2013 in Android devices. 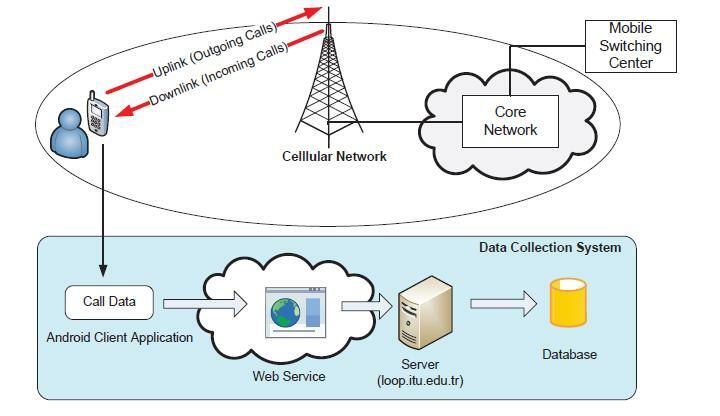 Collected data is stored in a database and to enable this, a web service is developed in order to ensure communication between mobile clients and the server, as shown in Figure 2. In order to avoid any bias due to different perceptions and expectations of test subjects, in our study we developed a data collection system independent of a laboratory settings. 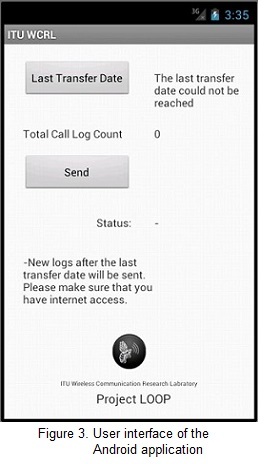 of each call of cell phone users was developed by using Android operating system and this application was uploaded to smartphones. The interface is shown in Figure 3, given below. The Application is now available for download!